On Saturday 9 March, members and supporters of the Revolutionary Communist Group, along with all the brigadistas preparing to go to Cuba on a solidarity brigade in April, came together in Trafalgar Square to celebrate 60 years of the Cuban Revolution and demand an end to the US Blockade. We demonstrated against the implementation of Title III of the Helms-Burton Act due to come into effect on 19 March, as threatened by US President Donald Trump in an escalation of sanctions against Cuba. We say loud and clear: No more blockade! No to imperialist intervention in Venezuela! Expose the lies of the British media! All strength to the Bolivarian Revolution in Venezuela and the democratically elected President Nicolas Maduro! On 2 February 2019, as a US-backed coup was underway against the democratically elected president of Venezuela, Nicolas Maduro, the Revolutionary Communist Group with Hands Off Venezuela and other supportive comrades and groups joined together to protest outside BBC Broadcasting House in London. This British media institution, like other so-called 'liberal' outlets has been instrumental in softening up public opinion to support the imperialist attack on Venezuela. Comrades and activists from the Venezuelan and wider Latin American community spoke on the platform to denounce the BBC coverage which has cast the coup leader Juan Guaido as a force for democracy and a freedom fighter, when in fact he has been nurtured by Washington's regime change apparatus. This is another example of the US empire's constant interference and terror in Latin America which seeks to undermine any attempt at building socialism and independence. Once again US imperialism can count on the voice of British imperialism, the BBC, to spread lies and misinformation which assist the imperialist plans. Imperialist hands off Venezuela! BBC, no more lies! 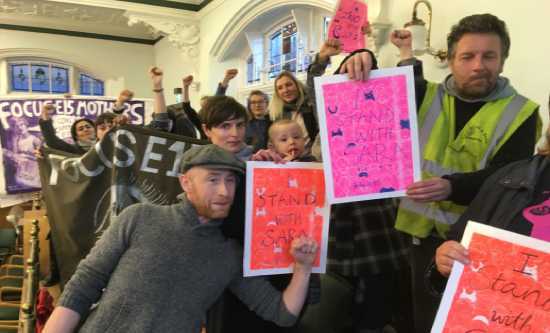 a new vote at Camden Council to repeal the International Holocaust Remembrance Alliance (IHRA) definition of anti-Semitism, which was endorsed by the council in 2017, now that it is clear that the definition is being used to curb free speech. In an unusual display of cross-party unity, Camden’s Tory, Liberal and Labour councillors lined up to defend IHRA and the cover-up over the use of Prevent officers to monitor political meetings. The Revolutionary Communist Group held a midday picket outside the offices of the Guardian and Observer newspapers on 21 December 2018. This was a protest against the blatantly hostile coverage of Venezuela, Nicaragua and, as always, Cuba, that these papers have carried out over the years. The prejudiced and ill-informed journalism that distinguishes these publications is a political attack on those nations which are attempting to oppose US, European and British imperialism. Moreover, the reports carried are bad journalism and completely fail to examine where the opposition to socialist governments is coming from, how they are funded and what the policies and agendas are for reaction in Latin America. They fail to explain why the IMF and World Bank structural adjustment programs were so devastating for millions and why there is now an attempt to reimpose them. On Saturday 1 December 2018, comrades from the RCG’s East London branch took part in an action organised by the Focus E15 campaign to reclaim a play park for the children of those forced into inadequate temporary accommodation at Brimstone House. On Saturday 17 November, comrades of the RCG supported the Extinction Rebellion event. This was an event called to indict the British state's criminal inaction in combating climate change and to demand immediate climate justice. No silence on police violence! RCG comrades joined the weekend events called by the United Families and Friends Campaign (UFFC) on 26 and 27 October in London. These consisted of a Conference entitled Interrogating State Violence: Custodial Deaths, Justice and Resistance, sponsored by Birkbeck Law department, 4WardEver, Migrant Media and Centre for Research on Race and Law, and the annual march to remember all those who have died in custody. On Saturday 25 August, members of the West London branch of the Revolutionary Communist Group along with supporters held an informal picnic at Holland Park to share food and discuss our Palestinian solidarity work in the area. After we set up, a group of Zionists arrived and sat down about ten metres away. They then began to tear around the park chanting anti-Palestinian slogans, dancing and waving the Israeli flag while taking pictures and filming our picnic. Following the horrific massacre of more than 60 Palestinians in Gaza by the racist Israeli state on Monday 14 May, supporters of the RCG and Victory to the Intifada in London came together with other supporters of Palestine to call for an end to all British support for Israel. The lively rolling picket targeted shops with links to the Zionist state, speaking out, petitioning, and spreading information about supporters of Israeli occupation and violence on Britain's high streets. The protest met at Barclays bank on Tottenham Court Road, highlighting the British bank's longstanding support for the state of Israel, and its continuing support for the arms trade. Barclays quickly closed its doors, and many customers expressed their outrage having discovered the bank's role in the oppression of the Palestinians. The protest then moved off down Oxford Street, highlighting other businesses which have trade, financial or ideological links with Israel. Other targets included Carphone Warehouse - which stocks Motorola phones -, Boots, the clothes shops Zara and H&M, HSBC, and finally Marks & Spencer's - one of Britain's biggest corporate sponsors of Israel which the RCG and Victory to the Intifada have picketed consistently since the outbreak of the intifada. (See below for information on these shops links to Israel). 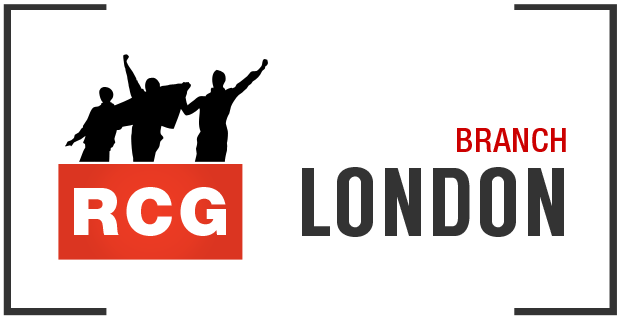 24 Jan 2018 - West London RCG and supporters attended the latest full council meeting at Royal Borough of Kensington and Chelsea (RBKC) town hall, where the Council was due to give an update on its response to the Grenfell fire. Over previous months RCG members have collected 1,500 signatures from the people of Kensington, demanding for survivors to be re-housed immediately, for criminal charges to immediately be brought against those responsible, and for a People’s Inquiry led by the local community. We came to the council meeting to submit the petition on behalf of the many who signed it. Maintaining and building protest at these meetings remains crucial. According to the North Kensington Law Centre, more than seven months after the fire, only 54 households made homeless now have permanent accommodation, and 98 households are still in emergency accommodation. This is despite the famous pledge by Prime Minister Theresa May that they would be rehoused within three weeks. Thursday 14 December marked six months since the tragic fire in Grenfell Tower. During the day there was a memorial service at St Paul's Cathedral, which was followed in the evening by the monthly Silent Walk. Members of the RCG attended the Silent Walk. Up to 2,000 people attended – survivors, families of the bereaved, community members and supporters, some holding green candles, others photos of the victims, giant green hearts and placards with various slogans. Outside Ladbroke Grove station fire fighters from Red Watch, North Kensington fire station lined the streets and were thanked by the crowd. On Monday 27 November RCG comrades organised with local residents of North Kensington and allies from Focus E15 and the campaign against the Notting Hill Housing/Genesis merger to conduct a mobile protest of the homes of several councillors of the Royal Borough of Kensington and Chelsea (RBKC). Around 50 people participated, bringing with them banners, placards, pots, pans, fairy lights and an open microphone to mount a loud street action demanding criminal charges for those responsible for the Grenfell Tower fire and the immediate rehousing of survivors, the majority of who remain in inadequate temporary and emergency accommodation almost six months on. The protest was organised at a meeting with local residents the week before. On 22 November, the Revolutionary Communist group held its third public meeting since the devastating fire at Grenfell Tower in June this year. The meeting was held at the Maxilla Social Club in north Kensington. This venue has opened its doors to every kind of gathering for the last six months and we like to thank Joe Walsh for his kindness and support. Of course, this is not the only meeting place. Notting Hill Methodist Church is a centre of support for the neighbourhood. So also, is a large area under the railway bridge and Westway overpass, opposite the burnt-out Grenfell Tower. This has been cleaned and furnished as a permanent social space. It was established by local people as an area of remembrance and for candle-lit vigils. It has a huge Wall of Truth with statements from the community, a Garden of Remembrance, refreshments, seating, warm clothes, pianos and a library as well as an altar and several large and beautifully painted murals. On Saturday 14 October an educational event organised by the Revolutionary Communist Group and Rock Around the Blockade (RAtB) took place at Student Central, near Russell Square. The event was held to commemorate the immense revolutionary achievements of the past 100 years and to help support ongoing efforts around the world, with five speakers and rounds of discussion and debate. A day of discussion and debate on October 1917 in the former Russian empire and its impact on working class struggle around the world, as Cuba and Venezuela stand on the front line of revolutionary change in a world of capitalist crisis and war. On 18 May, the East London branch of the RCG joined the Focus E15 campaign at the Annual Council Meeting in east London to expose the corruption of Mayor Robin Wales and the Labour Council in Newham. As he congratulated two councillors for their 25 years of service, Robin Wales spoke of the beautiful entity that is Newham after 25 years of his reign as head of the council and then mayor, lifting it up from being an 'incompetent backwater' to a shining example for other councils. The reality is that there are more registered homeless people in Newham than anywhere else in the country, that 25% of people are living in overcrowded conditions and that Newham is one of the top boroughs in terms of forcing people to move out of the borough and out of London. The council is proud of increased satisfaction rates in council surveys, Robin Wales told the 300 people in attendence, claiming that it really is putting 'power into the hands of residents'. No mention of course was made of the Lobo loan scandal, £563m of debt from risky long-term loans, with debt repayment taking precedence over frontline services. No mention of the 46 Labour councillors in Newham who own or control almost 100 properties in the borough – including one who has 19 properties that bring in monthly rent of over £20,000.